Bitcoin price leads a brief market recovery session adding $169 in an hour on Friday. Trading BTC/USD is expected to resume on Coinbase Pro at 4:00 p.m. UTC. Bitcoin price broke the support we covered in the analysis published earlier in the day at $6,400. The slide continued below the short-term support at $6,350, but the bulls said no more to the sellers at $6,320. Currently, Bitcoin price has bounced in an engulfing candle adding at least $169 in one hour to trade above $6,500. The bullish trend has stalled marginally above $6,500 and BTC/USD is reacting lower as it seeks support above $6,480. The path of least resistance is currently to the upside. Besides, the stochastic is still ranging in the overbought region. $6,500 is the immediate resistance zone while $6,520 will offer more resistance towards yesterday’s highs at $6,596.1. 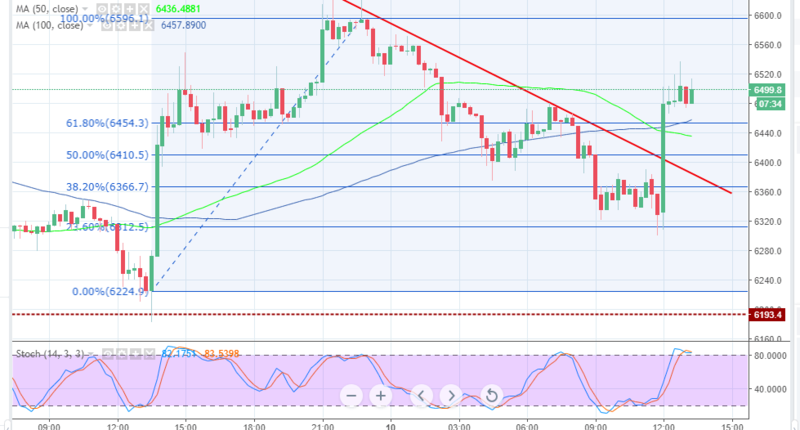 In the event, the support at $6,480 fails to hold, Bitcoin price will find support at the 61.8% Fib level taken between the last high at $6,596.1 and a low of $6,224.9 at $6,453.8. In other news, Coinbase announced that it had identified an issue on its Coinbase Pro platform that was affecting BTC/USD order book. The exchange moved to halt the pair from trading. Customers on the platform remained in distress as the company carried out investigations into the matter. “[status] Investigating: We are currently investigating issues with trading on the BTC-USD order book,” Coinbase Pro wrote on Twitter.